Replication is an issue of experimental design rather than technical design of a microcosm. 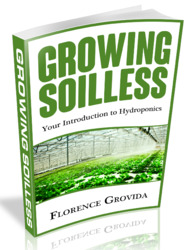 It is included in this discussion because of its critical nature to the "microcosm method" (Beyers, 1964) and because its consideration leads to fundamental questions of variability (possibly chaos) of ecosystems. 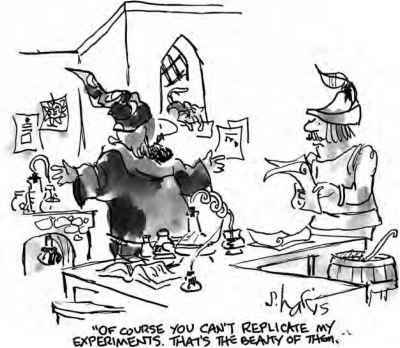 In fact, replication is one of the "minimal requirements of experimental design in ecology" (Hairston, 1989) as in any application of the scientific method. As noted by Sheehan (1989) "the main purpose of replication is the supply an estimate of variability (error) by which significance of treatment and control comparisons can be judged." Thus, replication is needed to distinguish between natural variation and variation due to a treatment (such as introduction of a toxin into a microcosm) in an experiment. The number of replicates required for an experiment depends on the variability of the data being collected. As has been noted, cross seeding is used in microcosm research to reduce this variability and thus "enhance" replication (Beyers and H. T. Odum, 1993). Problems do arise when considering replication of microcosms. In a review of 360 microcosm experiments, Petersen et al. (1999) found that only 65% of the studies reported the number of replicate systems per treatment, which implies that many researchers take replication for granted. While most studies and reviews focusing on replicability have found that it can be satisfactorily achieved in microcosms (Conquest and Taub, 1989; Giesy and Allred, 1985; Isensee, 1976; Levy et al., 1985; Takahashi et al., 1975), there is disagreement. For example, Abbott (1966) studied replicability of 18 5-gal (19 l) glass carboy microcosms of an estuarine bay and found that, based on coefficient of variation calculations, "... under proper conditions aquatic microcosms show replicability comparable to that found among other types of statistical trials. This means that groups of parallel systems can be established and studied in rigorously defined experiments, but only on a statistical basis." This was the first study devoted to the question of microcosm replicability, and it has been often quoted in more recent studies as justification for the experimental use of microcosms. However, Abbott's study was criticized on the very same grounds of coefficient of variation by Hurlbert (1984) and Pilson and Nixon (1980). 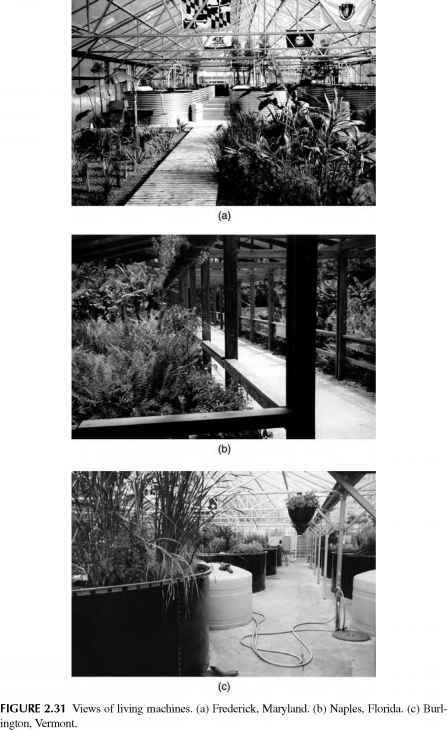 Furthermore, Whittaker (1961) in one of the first microcosm studies introduced the term aquarium individuality for "the marked differences between aquaria with similar conditions which result from minor, uncontrolled factors and are a major limitation on reproducibility and statistical adequacy of the data." Ironically though, Abbott (1966) quotes another pasage from Whittaker's paper as justification for the microcosm approach. Clearly, there is some subjectivity here, and there are no clear cut criteria on how similar replicate microcosms must be for use in experiments. Hurlbert's (1984) discussion is valuable in this regard as are papers reviewing the statistical treatment of microcosm research (Chapman and Maund, 1996; Gamble, 1990; several papers in Graney et al., 1994; Sheehan, 1989; Smith et al., 1982). Pilson and Nixon (1980) provide many practical insights on the issue. For example, they state: "The existence of variability is a severe problem, becoming even philosophically difficult to deal with. Nature herself does not replicate well. Every patch of water follows its own course to some extent, exchanging all the while with its surroundings. Every bay and cove is to some measurable extent unique." They discuss the dilemma of trying to develop a set of microcosms that replicate well but still exhibit the variability inherent in nature. Curiously, they conclude that "the better the microcosm the worse it replicates and, therefore, the worse it is as an experimental tool." They suggest long time period observations as the "way out of this morass," which is the opposite of most microcosm research that relies on short-term studies to avoid the almost inevitable divergence of replicate microcosm over time. General results of microcosm research seem to indicate that replication becomes more difficult to achieve as the microcosm becomes larger and as the experiment lasts longer, but there is clear scientific value in large and long-term microcosms. Probably the best strategy for ecological engineering as a whole is research at small and short time scales balanced with large and long time scales. concentrations of CO2 in the atmospheres were very different, ranging from 415 to 3,400 ppm and higher, compared with the ambient 300 ppm. They concluded by relating their findings to the idea that biological evolution might control atmospheric composition because different species compositions generated different atmospheric concentrations of CO2 in microcosms. theoretical analyses of mathematical equations; it remains to be seen how much explanatory power chaos theory will have in studies of actual ecosystems. Several other concepts exist in ecology for understanding the kind of divergence that occurs in "replicate" microcosms. Assembly theory (Drake, 1990; Weiher and Keddy, 1999) is one paradigm that seeks rules for understanding how different communities can arise from different sequences of seeding. Lawton (1995) has reviewed this literature, and interesting microcosm examples have been described for amphibian communities in temporary ponds (Alford and Wilbur, 1985; Wilbur and Alford, 1985), microbial lab cultures (Drake, 1990a,b, 1991; Drake et al., 1993), fruit flies (Gilpin et al., 1986), and wetland plants (Weiher and Keddy, 1995). The lottery model of community structure is somewhat similar in relying on historical explanation but is based on randomness. In this approach community composition depends on who colonizes a site first. 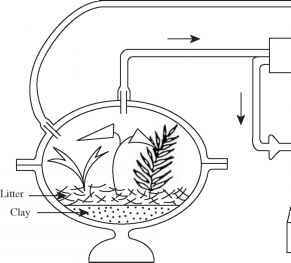 Sale (1977, 1989) first proposed this nonequi-librium concept to explain the local variation of fish diversity on coral reefs. The concept of priority effects, in which the presence of one species decreases the probability of colonization by another, has been introduced to account for some aspects of lottery-type behavior in ecological communities (Shulman et al., 1983). Finally, alternative stable states may explain the divergence of microcosms (see Chapter 7 for more details on the theory of alternative stable states). In conclusion, variability is an important consideration in microcosm research. Replication is necessary for testing hypotheses in the scientific method and the quality of replicates should not be ignored. However, the divergence of microcosms is interesting in its own right, and it might be capitalized on to understand certain aspects of ecosystem structure and function. Simberloff (1984) likened the "apparent indeterminancy in ecological systems," which is similar to the issue of microcosm replicability, to Heisenberg's Uncertainity Principle from physics, and he suggested its importance thus: "What physicists view as noise is music to the ecologist; the individuality of populations and communities is their most striking, intrinsic, and inspiring characteristic ... " In dealing with microcosms, ecological engineers must learn to appreciate the individuality of each replicate while using replication as a necessary feature of experimental design.